Follow us on Instagram and Facebook to stay updated on our latest happenings. While you’re here feel free to check out our merchandise or consider making a donation to help offset the costs of caring for our resident cats. We hope you come visit us soon. 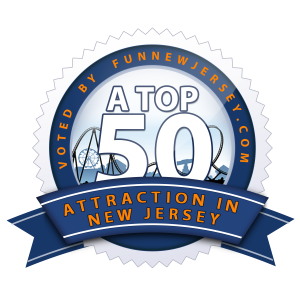 FunNewJersey.com has rated us a "Top Rainy Day Activity" in New Jersey! CLICK HERE to read the article! SUBSCRIBE TO THE "CATTY CORNER" PODCAST! Donate to help offset our costs and find these cats forever homes. + Who is Catsbury Park? We are a New Jersey 501(c) non-profit corporation with the goal of helping as many kittens and cats find loving homes through various channels. As many of you who followed us on social media might know, we started our rescue by taking in young kittens to our home in Asbury Park during the summer of 2016 and were able to place 51 kittens with forever homes within our first few months. Throughout 2017 we hosted several pop events, where we’ve had the pleasure of assisting MCSPCA and The Jersey Shore Animal Foundation with several more adoptions. By January 1, 2018 we had adopted 110 cats out in total, and the number is rising. We have created a space where the public can learn about cats, interact with them, and potentially take them home. While we still continue fostering kittens out of our home when possible, Catsbury Park Tea House & Cat Lounge (which opened in September of 2017) main focus is adult cats that, while available for adoption, are residents of the cafe and interact with customers in a unique and welcoming environment for both felines and humans. We offer an extensive menu of treats and teas that you can enjoy whilst visiting with our resident cats. + What is a Cat Cafe? Cat Cafes started in Asia nearly 20 years ago and due to popularity began making their way to the United States a few years ago. In essence, a cat cafe is a way for the public to interact with cats in a unique, social, non-shelter environment. All of the cats in Catsbury Park's cat lounge are available for adoption. Catsbury Park is the first full service Cat Cafe in New Jersey! + Where do your cats come from? Catsbury Park works closely with several local shelters, namely MCSPCA, Associated Humane Society & Jersey Animal Foundation who works with Ocean County Animal Shelter. + Can I bring my cat(s) to the lounge? Unfortunately no. In order to provide a safe, comfortable, and stress-free environment for our cats while they are with us we cannot allow any cats that are not Catsbury Park cats to visit. Don't worry; your cat isn't interested in coming to our lounge either. We will have a variety of unique cat items for purchase, many of which are from local vendors. Our trained staff and volunteers can help you pick out a gift to appease your cats at home (or your own guilt for playing with "other" cats, the nerve!). + There is a cute kitten/cat in my backyard. Can you come get him? Can I drop him off at the lounge? Although we are committed to helping as many at-risk cats as we can, we simply can not take cats or kittens from the public under any circumstance. Doing so puts all of our cats at risk, and we are not a qualified shelter. If you have found a cat or kitten please contact your local shelter. These people/organizations are equipped and trained to handle these sorts of situations. + How can I help support Catsbury Park? Coming in to visit Catsbury Park is already helping us. Every dollar you spend while visiting us, from teas to merchandise and even visiting with the cats. You can also help us further by donating to our gofundme campaign, paypal account or shopping on our amazon wishlist. We also accept donations delivered in person of anything cat related like, toys, food, litter, beds and we can also use your old towels and linen. We also have a donation jar in the cafe. + Can I work/volunteer at Catsbury Park?